During the CEBIT 2018 we announced the better iPad Pen technology support of our CIRCULARO™ sign anywhere experience. eSigning capabilities are cornerstone of our paperless services and solutions and we recognize increasing demand for mobility and pen technologies as part of more natural digital ink experience while filling the electronic forms and signing the PDF documents. As iPad 2017 models are becoming more affordable we do expect that many enterprise customers will be adopting iPad Pen technology as part of their digital transformation initiatives especially for all different client facing interactions, field sales and service operations. 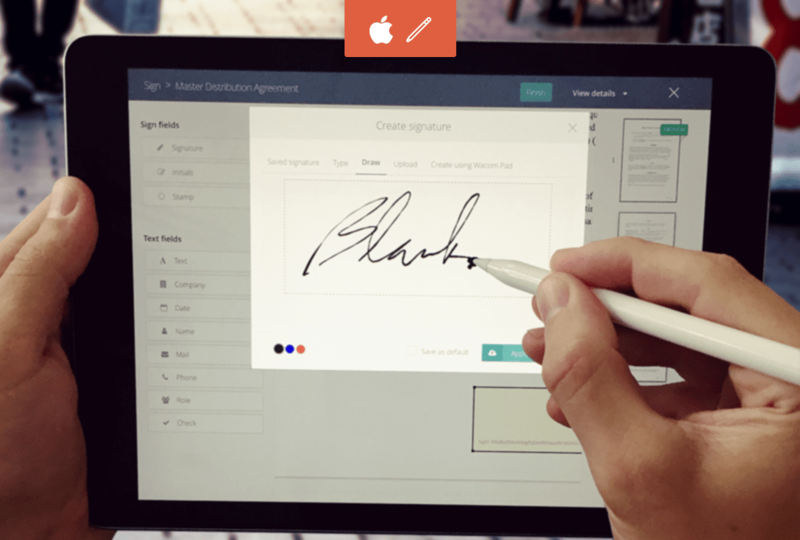 CIRCULARO™ platform now supports various kinds of eSigning devices and signing methods starting from well known WACOM signing pads, iPads and Samsung tablets. Currently we are working on providing better support for Microsoft Ink Pen technology as well. Our sign anywhere on any device approach brings many benefits to our clients who can mix and match different devices and eSigning methods as part of their paperless strategy solely based on their real business needs and particular use cases without being forced to make sometimes hard choices between different tablets or eSigning pads.